After being out of town for a few days it was nice to get back home and make some dinner. After dining at C.I.A. (The Culinary Institute of America, not the government organization that reads your emails) and Harvest Cafe I was happy to take some random things out of my freezer and fridge and make some dinner for Jen and me. 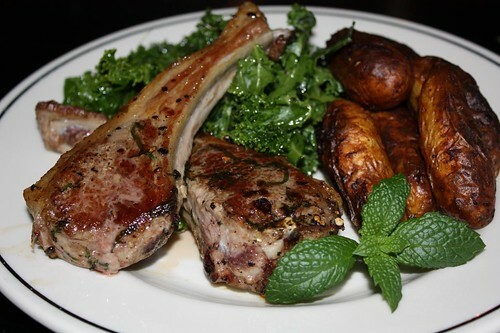 I had some grass fed lamb chops from Pine Hill Farm in Genesee Valley, New York. I tossed them in a bit of olive oil, salt, pepper, chopped garlic, and chiffonade of mint leaves that we grew in our little kitchen garden. Then I seared them in a pan and finished them in the oven. The lamb was very good. It didn't have the strong taste of New Zealand lamb nor the bland corn fed taste of your normal American lamb. It was a nice balance between the two. Unfortunately I can't find any information on line about this farm or how or where to get your hands on some more of this lamb but if you ever do come across it you should pick some up. To accompany the lamb I made a kale salad with a sweet pepper dressing. I also roasted some Russian banana fingerling potatoes from Satur Farms on Long Island. I tossed them with olive oil, salt, pepper, and "Spanish" paprika. I don't think it was actually Spanish but for the purposes of this dish I wanted it to be. Since it didn't say one way or another on the bottle I figured it could go either way. Should I need it to make gulash in the future I will just wish it to be Hungarian in that instance. It's very versatile in that respect. I enjoyed all of this with a Summer Weizen Ale from Smuttynose Brewing Company in Portsmouth, New Hampshire. I offered Jen a sample and she said it was quite nice as this is her favorite style of beer. Luckily this was before I discovered on the label that it was made with chamomile flowers, her least favorite style of flavor. The taste, however, was barely noticeable and even Jen admitted that it was tasty. Next week will be all about clearing out perishables from the fridge before we journey out of town for a bit. If there are any entries during this time it is likely to be pretty sad. It might be boiled potatoes with buttered noodles and miso broth. It'll be like Iron Chef with the bad theme ingredients and no additional pantry items to choose from.